If you are a diver than chances are you will love a good beach. Although most of us are not lovers of the overcrowded tourist beaches found in such places as Los Cristianos and Las Americas. So here are a few beaches that are not generally over crowded. El Medano has a string of beaches that most have heard of even if they haven´t visited. The town, once a typical Canarian fishing village has become a popular seaside resort yet the beaches are rarely crowded and you will always find a place to put your towel. The longest beach on the island, a two kilometre stretch of fine golden sand. Half of this beach is in the town and is backed by restaurants, shops, and cafes where you can have a drink and enjoy the day, and on a weekend there is a market with craft stalls. The other half of the beach is the ideal place for windsurfing. Mainly locals use the small patch of sand in this cove next to the small pier where you will always find anglers trying their luck and colourful boats bobbing on the waves. This is one of only a few beaches in Tenerife you can enjoy with your dog. The grey sands not only attract pet lovers, but due to the force of the waves at certain times of the year, it is popular with surfers. A mixture of light brown sand and rocks form a small bay where you can be sheltered from the waves. You can park on the road close by and because of its proximity to the hotel locals and tourists mix happily together. La Pelada is a secluded beach very popular with naturists. The waves can be wild and the sand is volcanic but if you seek solitude this is where it can be found. Tajao beach is an idyllic place to spend the day sunbathing and swimming, then round it off with an excellent meal in one of the village’s famous fish restaurants. You can park next to the beach or in one of the nearby streets. 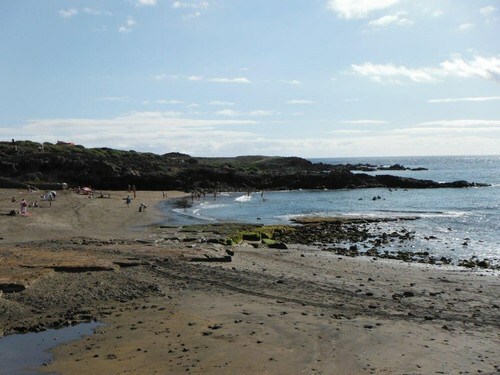 Located in the village of Abadas, Los Abriguitos consists of fine volcanic sand and its waters are usually calm and suitable for the whole family. There is plenty of parking and in the village plaza you will find a supermarket, restaurant and a couple of cafes. This part of coast is a popular diving area so a common sight is to see divers practising or people snorkelling close to the waters edge. After the beach, and across a path, you’ll reach Playa Cardones, smaller and nearly always empty, as many people are not aware of this little cove. Some say this is one of the most beautiful beaches on the island. Next to the town of El Poris, it has golden sand and calm clear waters. You can see the wind farms in the near distance that may give you a hint that it can be a windy spot. Probably the reason there are few tourists but on a calm day it is worth a visit. If you are looking for peace this beach is the ideal place to spend a quiet day. Unknown by tourists the only occupants are locals who will visit at the end of a hard day’s work. The sea is usually very calm so taking a dip in the crystal clear waters is a pleasure. At the back of the beach, there is a small promenade where you can sit in the shade watching the sea, or read a book.